Chromecast is officially supported in VLC media player 3.0. So, you have one more method to stream local media (music and video) to Chromecast and Chromecast Audio. Open source. If the development stopped or went in the wrong way, anyone (there is always someone) can continue to work on it or fork it. 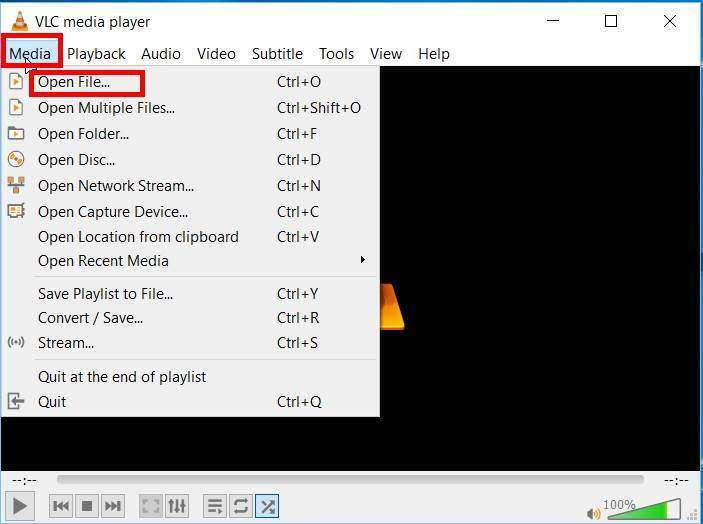 The VLC media player supports all formats that can be played on your PC. Chromecast and Chromecast Audio were designed for streaming, and therefore the number of codecs supported is very limited. When streaming local media files to Chromecast, transcoding is often needed. Prior to VLC 3.0, we recommended Plex and Videostream because they can transcode. You do not need any other software. For Plex users, a Plex server is required to transcode (and to manage the media). Videostream has basic transcoding capabilities. VLC media player has excellent built-in transcoding capabilities. 4K support. If you have a Chromecast Ultra and some 4K contents, the VLC media player is your best option to stream 4K contents to Chromecast Ultra. Plex is the other option. HDR 10 support. Again, only VLC media player and Plex media server support HDR when you stream local movies to Chromecast Ultra. Compared to Plex media server, VLC media player is easier to use without needing any setup. Except managing the media library, VLC media player offers a better solution for transcoding and streaming. So, if you need to manage the library of your collections, you should still use Plex media server. VLC media player does not manage your collections. Otherwise, you should try VLC media player. 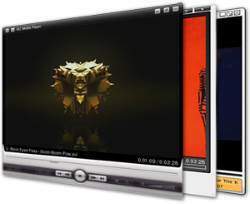 The VLC media player is free and available in most operating systems: Windows, Mac, Linux, UNIX, Android, iOS, and ChromeOS. 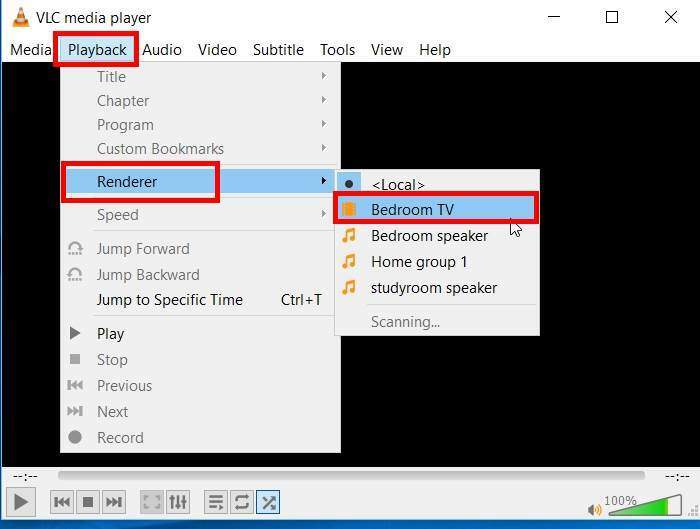 This guide assumes you are a new user of the VLC media player with a Windows 10 PC. If you are using VLC for Android, you may check this guide. The official VLC media player is free. There are no ads or bloatware. It is very clean. 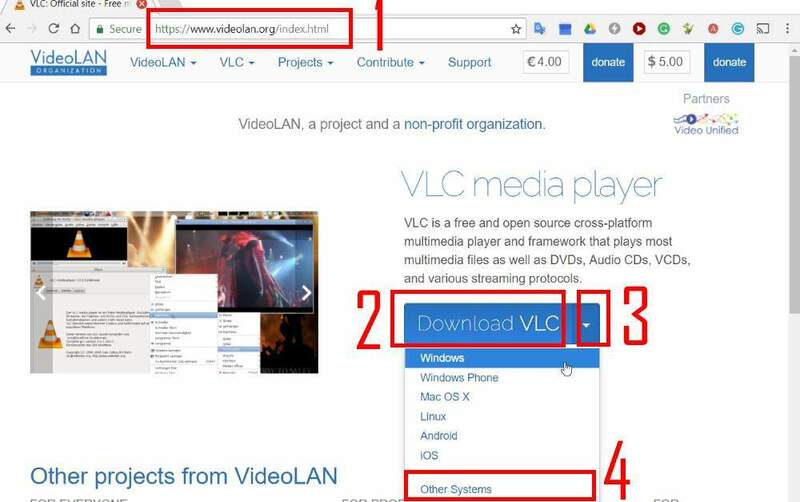 As shown below, if you visit the official VideoLAN site (marked as 1), you can find the download link (marked as 2). 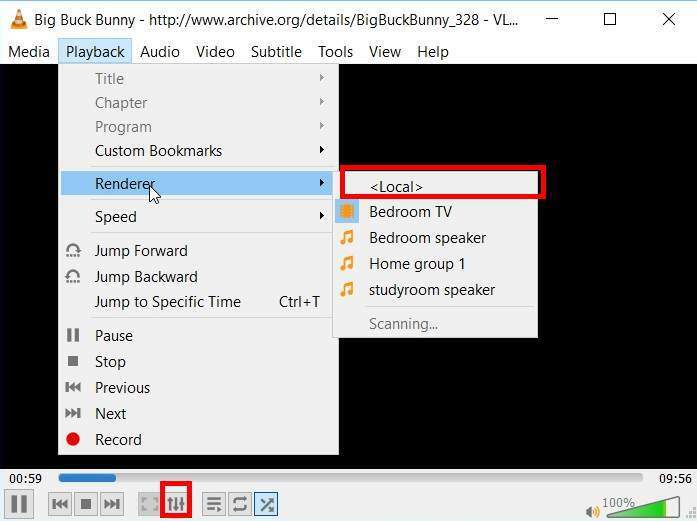 For Windows users, by default, if you click Download VLC, you will start to download the 32-bit installer of VLC media player as shown in next screenshot. Please note, the 32-bit installer is the best option for most users. You do NOT need to download the 64-bit installer, although you can (read on). If you do not want to install programs on the PC, you can download the portable version (for which you just need to unzip). If this is the case, click the down arrow (marked as 3) in the screenshot, then click other systems (marked as 4) as shown below. After clicking other systems, you are now directed to the official download page of the VLC media player as shown below. For Windows users, click Get VLC for Windows (marked as 5 in the screenshot below). Personally, I would not recommend you to get VLC media player through Windows store unless you have no options (for example, you are using Windows 10s). 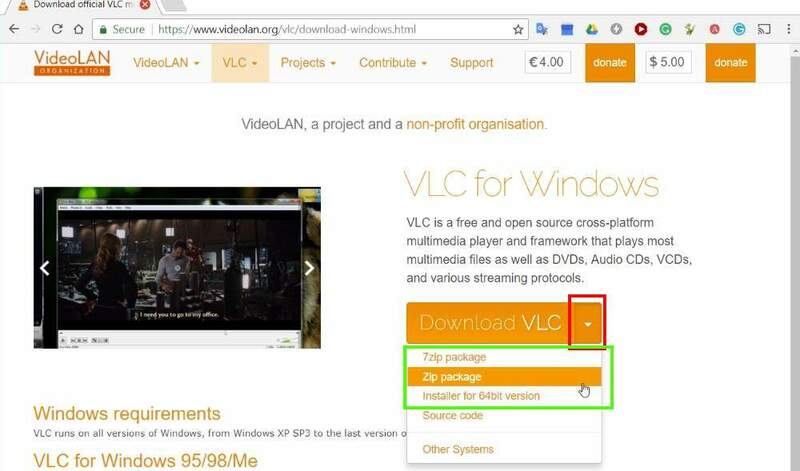 In VLC for Windows page, click the down arrow in the right side of Download VLC as shown below. Download 32-bit installer (if you click Download VLC directly). Download 7zip package. This is a portable package in 7zip format. You just need to download, unzip it. Then you can use VLC media player without installation. BTW, 7zip also a free and open-source program. You should install it if you haven’t done so. Download Zip package. This is a portable package in zip format. Download 64-bit installer. If you want to run 64-bit version of VLC media player, you can download and install this one. Please note, the installers require installation. Zip or 7zip packages are portable versions. If you downloaded the 32-bit or 64-bit installer, you need to install it just like installing other programs. If you downloaded the 7zip or zip packages, you just need to copy it to any folder then unzip it. You can even unzip the VLC media player to a USB thumb drive. When you run VLC media player the first time, you need grant the network permission as shown below. As mentioned, VLC media player is a clean and open-source app; it is safe to grant such permissions. Tap allow access as shown below. Otherwise, you may have some problems in using the VLC media player. 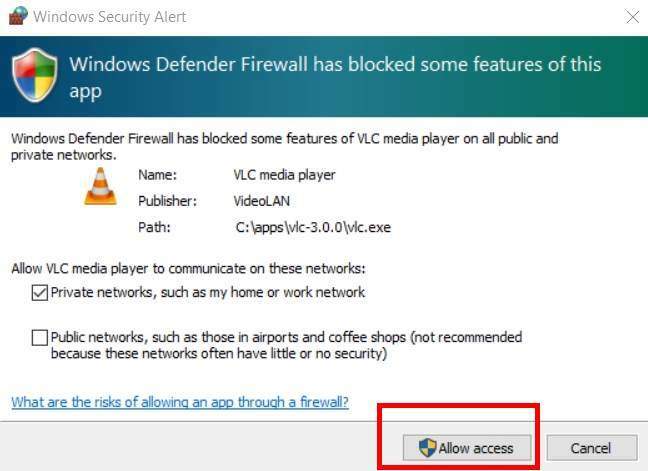 If you are using other firewall software, you need to grant permissions similarly when you see the pop-ups. There are no particular firewall settings for the VLC media player for most anti-virus and firewall software. 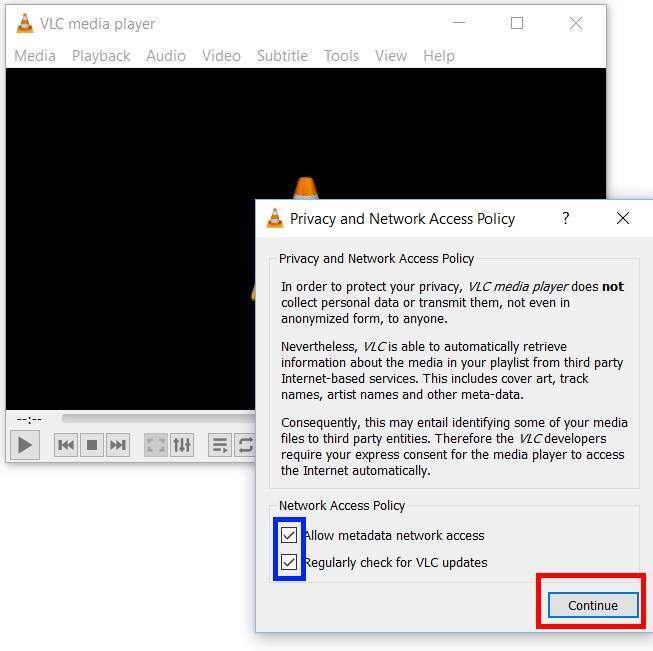 Before you can access VLC media player, you are prompted for the privacy and network access policy window. This appears only for the first time use. You can check or un-check the two options: allow metadata network access and regularly check for VLC updates, then click Continue as shown below. Unlike the firewall permissions, unchecking these two options does NOT affect the program. You only create some inconvenience for yourself. In PC, VLC media player does NOT use casting icon as in Android, or in Chrome browser. Instead, VLC media player just treats Chromecast (or Chromecast Audio) as an output device (renderer). So, you choose Chromecast or Chromecast Audio devices in Playback—Renderer as shown below. Local is the default option. It means your PC’s monitor and speaker. To use VLC media player to stream music or movies to Chromecast, you need to choose a Chromecast, Chromecast Audio, or Google Home device. All Chromecast and Google Home devices in the same network should be shown here. Connecting through an Ethernet cable or wirelessly does NOT matter, as long as they are connected to the same router as the PC. If VLC media player does not detect any specific Chromecast or Google home devices, you can check it in Chrome browser. After choosing the Chromecast or Chromecast Audio device, you can now select any media files that can be accessed from the PC. You can open a file or a playlist. For example, if you want to play a video file, go to Media — Open File to open it. The movie should be played on the TV now. If the movie or music is being played in Chromecast, Chromecast Audio or Google Home, you can see the title of the media file in the top of player as shown below. In this example, Big Buck Bunny is being played on a TV. The VLC media player icon is shown in the player window. You can control the playing just like playing to your monitor or speaker. As mentioned earlier, there is no casting icon in VLC media player. So, to stop casting, you can just switch the renderer to Local as shown below. Of course, you can also just close the player. 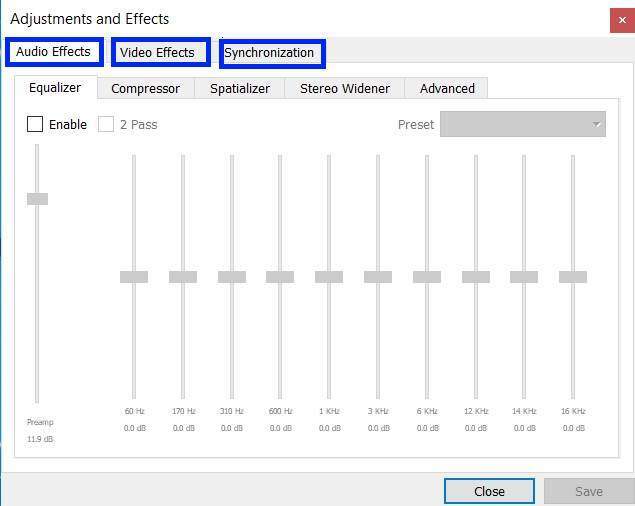 When using VLC media player to stream local media files to Chromecast, Chromecast Audio, or Google Home, you can use all video effects and audio effects offered by the player. You just click the effects icon as shown above. Can you use VLC media player on PC to stream music and video to Chromecast, Chromecast Audio, and Google Home? If you have any questions or encounter any problems with using VLC media player on PC to stream music and video to Chromecast, Chromecast Audio, and Google Home, please let us know in the comment box below. Fail – VLC did initiate my Chromecast and MP2 music files rendered just fine, but no MP4 files would render. The file name comes up on the Chromecast (TV), and there’s never ending blue bar on the bottom that animates from left to right. So, I tried a few AVI files and then I got sound but no video. Then I tried a few wmv files, but they also did not work at all. So, conclusion; Nice try, but no cigar! What happens if you switch back to Local (PC’s monitor), play a few secs, then switch back to Chromecast? You can also close the VLC player app, reboot the Chromecast, then try again. I have the latest VLC and it doesn’t detect my Chromecast. I CAN cast from Chrome. It can be due to some permission errors. You can try to reinstall VLC media player. When starting the program first time, it will ask for some network permissions. You need to grant them for the app. I did reinstall it and grant it the permissions. With this new version and the one I had before (also a 3.something). Never worked. You can try the equlizer when casting. Wanting to stream an internet audio (only) m3u file/url. I’m using VLC 3.0.3 and Windows 10. I can select the Chromecast Audio that’s connected to my stereo in VLC through Playback – Renderer… and select “Stereo” (the name I gave it). I select Media – Open Network Stream… then paste the “http://……….m3u” url and click Play. I hear a tone (similar to a USB device connecting to a computer tone) from the stereo, then nothing. Looking closer, while playing a song, switch renderer to “Stereo”, playback in VLC stops advancing. It still shows the pause icon (as if it’s still playing) but no advancement on the time played. i.e. I switch at 20 seconds, it freezes at 20 seconds. I can toggle the Play and Pause ‘button’, jump ahead or back on the time bar but it doesn’t play/progress. If you just play local mp3 files, can you play it to Chromecast Audio through VLC? Tried that too (forgot to mention). Same effect. While playing on , I switch to “Stereo”, hear the tone through the stereo then VLC “pauses” the tract. VLC doesn’t actually pause (like clicking pause), just stops playing the tract. I did find that the the m3u URL actually is something like “http:\\website\tract-selection.mp3.m3u”. In Chrome, if I take off the .m3u, it’ll play the .mp3 selection and I can (through Chrome menu) Cast to Chromecast Audio without problem. Temporary, not ideal fix. I’m thinking it may be an issue with something else I’ve installed over the years (computer about 6 years old… but not dead. lol). Maybe a driver or something silly like that. Just hoping it may be something more simple to tract down. …after “pausing”, I switch back to and it continues through the pc speakers as normal. Not sure. As Chroemcast support was only added to VLC 3.0. Very likely, there are some bugs here and there. For us, we haven’t encountered any issues. Only a few times, we have to reboot the PC. No problem. Was hoping it was something maybe someone has ran across before. I have to think that it’s not a VLC programming issue [directly] (because of how awesome the program is!) but maybe a stagnant driver of sorts on my machine or a Windows 10 update/change. My Windows is up-to-date. Could it be maybe a conflict with a different audio program lurking in the background? Hmmm. I’ll do some more exploring here. 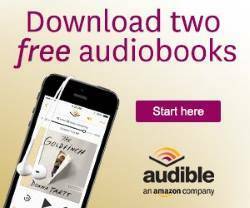 Some other useful/not-so-useful info: Free trial of Playcast works. Audio-Cast (via GitHub) sends the tone when connected, then nothing (as I explained VLC is doing). Again, no worries. Thanks for getting back to me. I’ll post back if I find anything from my ‘explorations’. I have a few questions about chromecast (ultra) and chromecast audio. I’m having a tough time figuring out which is the proper solution for my system. My sense is that audio from a chromecast (ultra), using a music app, would have better sound quality than from a chromecast audio. Either one would be attached to a high end receiver with a very good dac. Wouldn’t the chromecast (ultra) send data to the receiver at a higher rate, given that it handles (4k) video (and costs more), also given that the chromecast audio is designed to work with an inferior 3.5 wire, even if one used the TOSlink wire? My other issue is that I have multiple zones. Is it possible to group chromecast (ultras) if they’re playing music apps? My guess is no. If both assumption are correct, I would have to trade off inferior sound quality if I wanted to group multiple zones. Btw – I put ultra in parenthesis because I’m not sure if there’s a difference between chromecasts and chromecast ultras. 1. Chromecast Ultra does NOT support groups. Chromecast Audio and Google Home speakers do support it. If you need group support, you should go for Chromecast Audio. 2. Chromecast Ultra can handle 4K HDR and therefore specs are high. But this does not mean the audio bandwidth. Normally, this is not the bottleneck. Chromecast can also pass digital audio to you choose to use the TOSLINK cable. it is not the best optical audio cable, but it is sufficient for 99.99% users. If you do not need to cast video, you may choose Chromecast Audio. Otherwise, choose Chromecast Ultra (the normal Chromecast does not support 4K). 3. Chromecast Audio can connect to a dumb speaker. 4. Chromecast Audio has its own DAC. The DAC is not fancy (it is a $35 product anyway), but it is comparable with many $300-$500 receivers in the market, based on my ears. 1. there are probably no noticeable differences in audio quality if you are using a receiver (provided that your receiver can handle most types of audios through HDMI). Some receivers have a few limitations for HDMI audio. But they may have fewer limitations for optical input. 2. Yes, Chromecast Audio supports groups (see this old guide). You can create groups for them. When casting, you can choose to cast to an individual device or a group. Google Home speakers can also join the group (you can mix Chromecast Audio and Google Home speakers). Chromecast Ultra cannot be added to a group. VLC volume control is not effective when render is set to chromecast. how to control volume?. You need to control volume within the VLC. The volume control for the PC doesn’t work because vlc is not playing to the PC speaker. Yes, it’s group play. Please note, currently Chromecast Audio and Google Home speakers can be used (even mixed) for group play. But Chromecast and Chromecast Ultra (these are mainly for videos) don’t support this. When casting a movie with subtitles from my computer to the TV with VLC, the subtitles do not appear on the TV screen. Is there some way to fix this, or is it just not supported? Most subtitle formats are NOT supported currently when using VLC to cast to Chromecast. Please note VLC itself supports almost all subtitle formats. The limitation is for casting to Chromecast devices only.